Have you ever had one of those weeks? It seems as a mom they come more frequently. Not that everyone doesn’t have them but it is so hard when your little one can’t speak to tell you what’s wrong. It is trial and error to figure it out. If they’ve eaten, had a diaper change, been burped what else can be left? Well for us it is the heat. We have discovered just like her daddy this kid hates to be hot. Hard to maintain during the summer but we try, how you might ask, well by living in an igloo. On the hottest day of the summer I’m in a sweatshirt and my Ugg slippers because my darling daughter needs to be comfortable. Let me tell you, when she is overheated it isn’t fun! I also had my first experience of signing her up for events through our city. 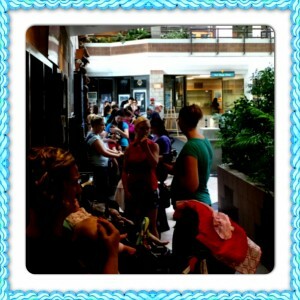 On Monday I got to wait in line for almost an hour to be afforded the opportunity to sign us up for some fall classes. Let me tell you I’m glad I got there when I did because I took the photo found at the end of the post about 10 minutes after I got there. The line wrapped out the door. Amazing what we do for our kiddies. It is not ironic that as an A type personality I literally would have my day scheduled. To the 15 minute block when I was in my previous job. Some days I would have to schedule a bathroom break as to not get that slot filled. Now I loved what I did, managing multiple fundraising programs, staff people in multiple locations and getting to see the amazing reward of the patients/survivors and their families. My life is scheduled in a different way now. It revolves around diaper changes, feeds and naps. Throw in a few wardrobe changes for good measure depending on how the feeds and diaper changes went. Today I tried 4 times to sit down and write this blog but it just wasn’t happening…someone else required my undivided attention and since we have started teething and are not always a happy camper I obliged. Time is something that some individuals sell and of course something that we all wish we could have more of. So for tonight the laundry will have to wait to get folded–hey it got washed and dried that’s huge, the emails that aren’t urgent will sit in the inbox and this mama is going to enjoy her couch, a warm blanket and the video monitor watching that amazing little girl all snuggled in her crib. Chickens, puppies and piggies, oh my! So today was one of those days. A lot has happened in the last two weeks since I wrote. Little Miss rolled over for the first time. Not sure who was more excited me or her dad who was showing the video to everyone! Today is the feast day of the Virgin Mary and I decided to go to church…okay so this was picked up from Friday where I left off…it never ceases to amaze me at how people feel free to comment on anything and everything when you have a child. Little Miss behaved greatly. She had a bottle without a freak out before (go me on the timing) and I even was able to cool her down in the warm church. To cool her down off came her socks and sandals and obviously her blanket. So as church was wrapping up a couple of ladies came over to see her. The first thing they both said was how I needed to put socks in her right away so she won’t catch a cold. Did I also know how quickly babies can catch a cold?!? Okay so I might not be up on how fast a baby catches a cold, I’ll give you that one, but did you know my baby hates to be hot? Did you also know how I had been up 5 out of the last 7 nights because the house was wayyyy to hot for the little one? Did you know how I was the one that carried her for 40 weeks plus 10 days because she didn’t want to come out until she was ready? Did you know she is not like any other child as she is a complete individual. So my dear ladies, next time you want to tell me how my kid needs to wear socks in the middle of August in a non air conditioned church I may have a hard time biting my tongue.